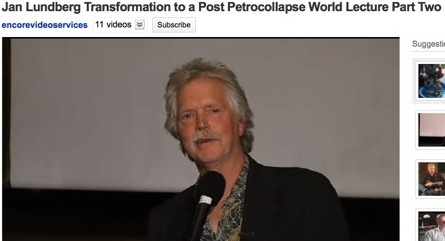 Three videos are offered from my talk at the March 5 Pasadena, Calif. gathering of North East Los Angeles Transition, after screening "Transition 1.0 - from Oil Dependence to Local Resilience." With footage for over 20 minutes for my talk, two parts had to be created for YouTube's requirements, plus a third video of humor and music. Enjoy these one after the other, or do the funny third one first. Comments welcome, as are requests for Jan Lundberg's appearance at your local venue for your organization. Please! I don't own a motor vehicle; the RV -- the one used for this music video -- was the "top of the line" in the early 1970s. It was made by a troop transport contractor, and now belongs to one of my cousins. Thanks go to Dana Lyons whose hilarious song "RV" is excerpted preceding my performance of "Freedom Says" at the NELA Transition event. This Depavers song is dedicated to David Gypsy Chain, a Humboldt forest defender killed by a pro-corporate logger in 1998. The song is on our album "Have a Global Warming Day" and in a demo version on a Depaver Jan album "Redwood Dreams." These videos were produced by David Nathenson in Huntington Beach, Calif. Visit EncoreVideoServices.com. Learn about North East Los Angeles Transition and read a report on the March 5th event at NELAtransition.org. The group photo shows NELA organizer Eric Einem (left, ponytail). The venue was Throop Hall at the Unitarian fellowship in Pasadena, California. 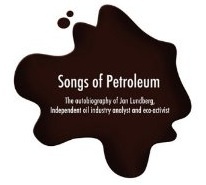 video still by David Nathenson, March 5, 2011, Pasadena, Calif.
Jan Lundberg's new autobiographical book Songs of Petroleum is now available in print at Amazon.com. Better yet, have your local independent bookstore order it for you.